Andrew Hutchings of NGINX, Inc.
NGINX release 1.9.1 introduces a new feature that enables use of the SO_REUSEPORT socket option, which is available in newer versions of many operating systems, including DragonFly BSD and Linux (kernel version 3.9 and later). This socket option allows multiple sockets to listen on the same IP address and port combination. The kernel then load balances incoming connections across the sockets. Editor – For NGINX Plus users, this feature is supported in NGINX Plus Release 7 (R7) and later. 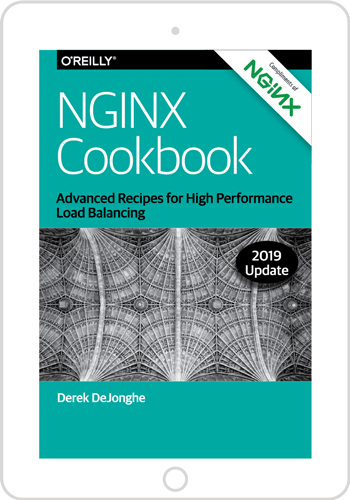 For an overview of all the new features in that release, see Announcing NGINX Plus R7 on our blog. The SO_REUSEPORT socket option has many potential real‑world applications. Other services can use it for easy rolling upgrades of executables (NGINX already supports rolling upgrades through different means). For NGINX, enabling this socket option can improve performance in certain scenarios by reducing lock contention. As depicted in the figure, when the SO_REUSEPORT option is not enabled, a single listening socket notifies workers about incoming connections, and each worker tries to take a connection. With the SO_REUSEPORT option enabled, there are multiple socket listeners for each IP address and port combination, one for each worker process. 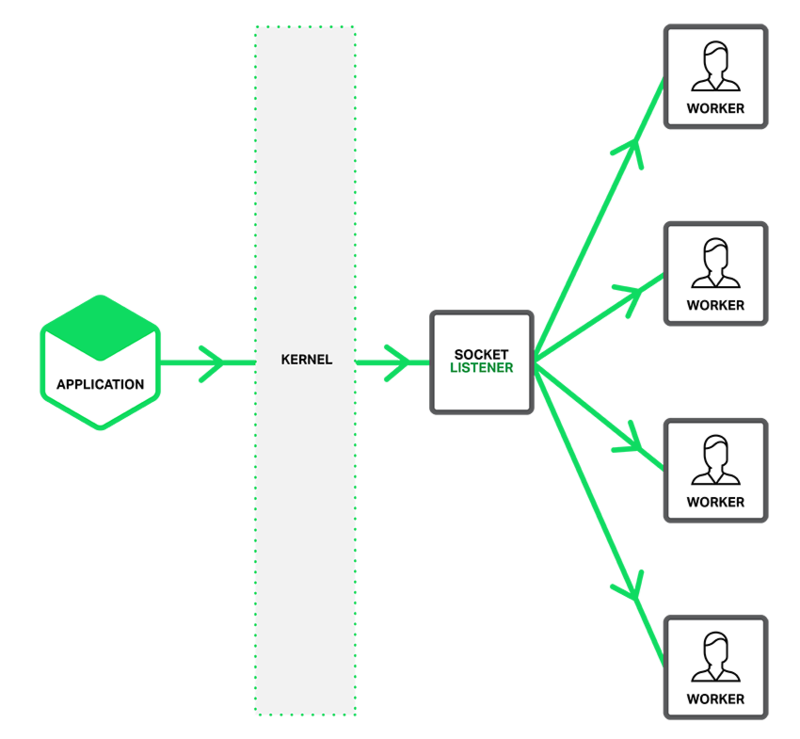 The kernel determines which available socket listener (and by implication, which worker) gets the connection. This can reduce lock contention between workers accepting new connections, and improve performance on multicore systems. However, it can also mean that when a worker is stalled by a blocking operation, the block affects not only connections that the worker has already accepted, but also connection requests that the kernel has assigned to the worker since it became blocked. Including the reuseport parameter also disables the accept_mutex directive for the socket, because the mutex is redundant with reuseport. It can still be worth setting accept_mutex if there are ports on which you don’t set reuseport. I ran a wrk benchmark with 4 NGINX workers on a 36‑core AWS instance. To eliminate network effects, I ran both client and NGINX on localhost, and also had NGINX return the string OK instead of a file. I compared three NGINX configurations: the default (equivalent to accept_mutex on), with accept_mutex off, and with reuseport. 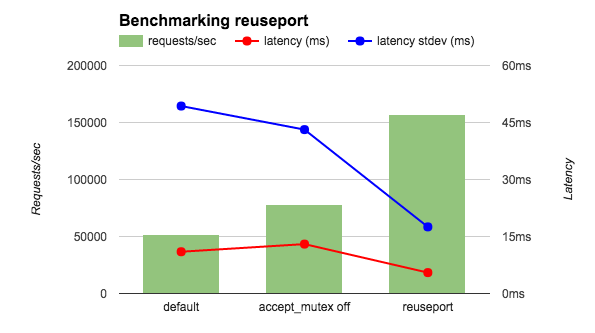 As shown in the figure, reuseport increases requests per second by 2 to 3 times, and reduces both latency and the standard deviation for latency. I also ran a related benchmark with the client and NGINX on separate hosts and with NGINX returning an HTML file. As shown in the following table, with reuseport the decrease in latency was similar to the previous benchmark, and the standard deviation decreased even more dramatically (almost ten‑fold). Other results (not shown in the table) were also encouraging. 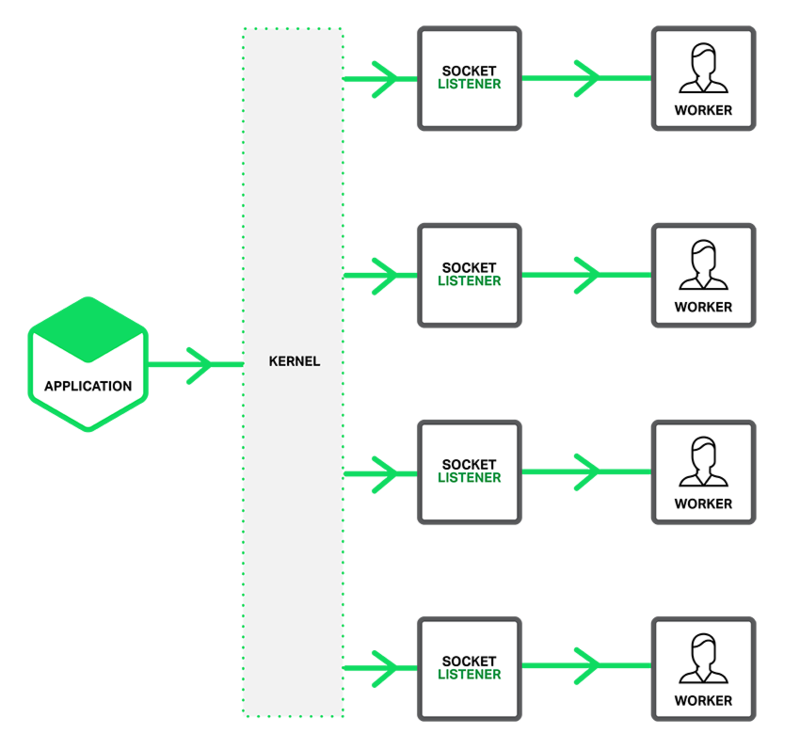 With reuseport, the load was spread evenly across the worker processes. In the default condition (equivalent to accept_mutex on), some workers got a higher percentage of the load, and with accept_mutex off all workers experienced high load. In these benchmarks, the rate of connection requests is high but the requests don’t require extensive processing. Other preliminary testing also indicates that reuseport improves performance the most when traffic matches this profile. (The reuseport parameter is not available on the listen directive in the mail context, for example, because email traffic definitely does not match the profile.) We encourage you to test reuseport to determine whether it improves performance in your NGINX deployment, rather than applying it wholesale. For some tips on testing NGINX performance, check out Konstantin Pavlov’s talk at nginx.conf 2014. Thanks to Yingqi Lu at Intel and Sepherosa Ziehau, who each contributed a solution to the NGINX project that enables use of the SO_REUSEPORT socket option. The NGINX team combined ideas from both contributions to create what we believe is an ideal solution.